Showing results for tags 'semi-final'. IrnBru Cup Semi-Final Inverness welcome Irish Premiership side Crusaders to the Scottish Highlands for the IrnBru cup semi-final. Just when you forgot all about this competition, someone somewhere comes up with a date and time to suit everybody. Well, the date is Sunday 18th February, the time is 17:15. I kid you not. The weather has relented in the last couple of days which is just as well as the pitch looked somewhat tired and heavy after weeks of dismal winter weather took it's toll. I would still expect a less than velvet surface with the going soft. Logistics aside, the competition has reached the last four with Inverness v Crusaders (Northern Ireland), and New Saints (Wales) v Dumbarton. To give New Saints their Sunday name, it's The New Saints of Oswestry Town & Llansantffraid Football Club. They play in Oswestry, Llansantffraid-ym-Mechain. That'll be why TNS is the preferred title. Thankfully, it's Crusaders that we play and they are known as the Crues. ***Latest News*** We now know one of the finalists and it's congratulations to Dumbarton who have reached their first Cup final in over 100 years. They came from behind to beat TNS 1-2 with late goals from Danny Handling and Dimitris Froxylias. Former Caley Jags player Dean Ebbe had given TNS the lead early in the second half. So what do we know about them? They hail from Belfast where they have a 3383 capacity all seated stadium, Seaview. Manager Stephen Baxter is a former player and has been in the job since 2005. They play in red and black, so they have something in common with half of Caley Thistle. In season 2016/2017 they relinquished their title and finished second in the NIFL Premiership behind one of their Belfast rivals, Linfield. It was a last day victory for Linfield that decided the title. However, this season appears to be back on track with Crusaders 5 points clear with 10 games remaining. Some impressive stats so far, Played 28:- Won 22 - Lost 2 - Goals For 82 - Goals Against 28. Crusaders last game was a 4-2 victory over Glentoran although they were knocked out of the Irish Cup a couple of weeks ago 4-1 by Cliftonville after being reduced to ten men. Jordan Owens, Billy Joe Burns, Colin Coates and Gavin Whyte were the scorers in the win over Glentoran. Gavin Whyte is the top scorer in the division with 18 goals, and fellow Crusader Paul Heatley is third with 13 goals. Whyte was the man that scored a last minute goal to knock out Dundee United in the last round. The 22 year old is regarded as a flying winger and one of the hot prospects in the Irish Leagues. He was also a signing target for Dundee United at one point but he is content to remain at Seaview for now where he is scoring goals almost every week. Recent signing Darren Murray is also amongst the goals and scored a brace on his debut in the 3-0 win over Carrick Rangers. The former Warrenpoint Town striker feels he will benefit from playing at Crusaders as he will get more scoring opportunities. He has already notched 12 for the season. Check out this BBC Sport footage of their win over Glentoran. Crusaders v Glentoran From the Belfast Telegraph, defender Sean Ward said the players are relishing the chance to progress to another major final. "It's been a good competition for us and like every one we enter we want to go as far as we possibly can," said Ward. "We are confident we can beat Inverness, there is no doubt about that, but we will need to perform well. "We will give it our best. To reach the final will be special. Players want to play in finals, it's why we play the game and it's another massive opportunity to reach a big final. "After the disappointment of the League Cup semi-final and Irish Cup it's a welcome distraction for us. We will face a full-time Inverness outfit who will be good but we will give it our best and see if it's good enough." And manager Stephen Baxter added:- "This Inverness game is a break away from the relentless pressure and tension of the league games. It's a big game of football but it will be a nice break for us. "We will give a good account of ourselves. We won the Setanta Cup which was a huge lift to everyone and reaching an IRN BRU semi-final is a big feather in our cap as these are the best teams in our islands." Inverness have stuttered somewhat in recent weeks and have also dropped out of the Scottish Cup with a 1-0 defeat to Premiership side Dundee after a replay. That was our last game (30th Jan) as the weather saw the Dundee United game postponed. We were idle last weekend as we were not involved in the Cup and had no game arranged. 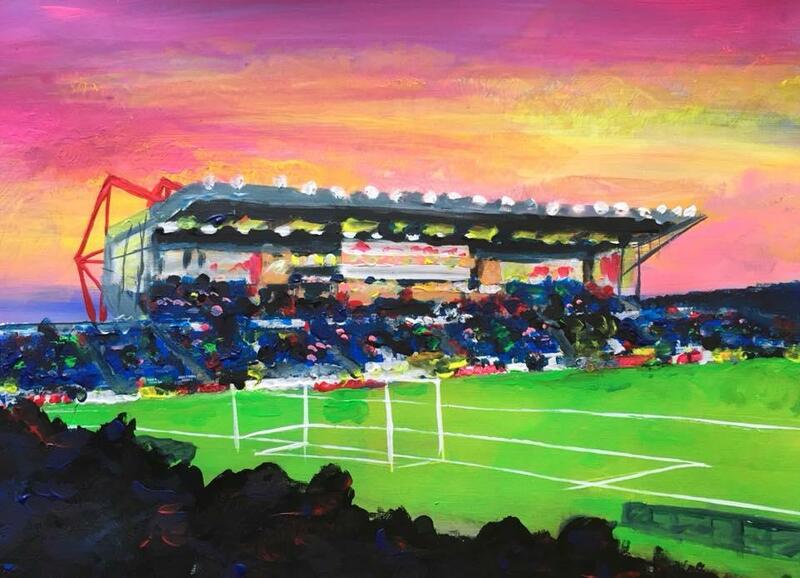 Before the Dundee game we lost 3-1 at Falkirk in the Mulraneygate encounter. We were comfortable until Jake saw red and once we were reduced to ten men we lost the plot like Jake. We are lingering in no-mans land at the moment in seventh place in our own Championship. Team News It's been a slow news fortnight in the Highlands football wise, but here are the last known team line-ups for both squads. Carl Tremarco is still injured and Nathan Austin is cup-tied, otherwise Robbo should have a full squad to choose from. Inverness (v Dundee) : Ridgers, Mckay, Warren, Donaldson, Calder (Mackay 83), Chalmers, Vigurs, Polworth, Bell (Mulraney 67), Doran (Baird 67), Oakley Crusaders (v Glentoran) : Jensen, Ward, Burns, Coates, McChrystal (Beverland 46), Lowry, Forsythe, Heatley, Owens, Murray (Caddell 78), Whyte (Cushley 88) More detail and Robbo chat can be found on the Official Preview. 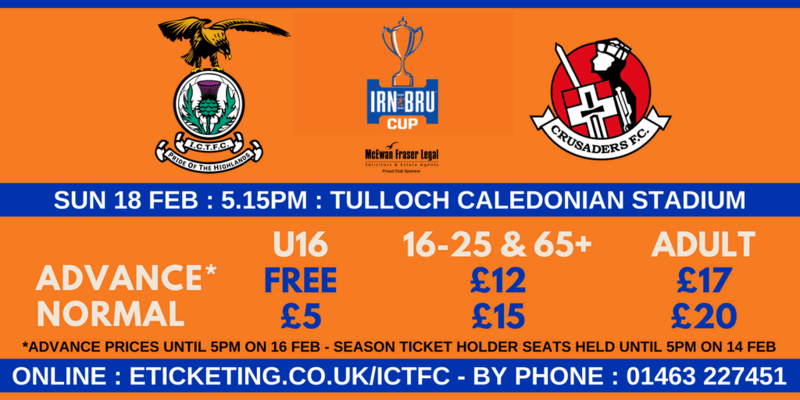 From the Crusaders website:- Any Crusaders supporters going to the Irn Bru Cup Semi Final on Sunday against Inverness Caledonian Thistle are asked to gather at the ICT Social Club at 28 Grieg Street where a bus will transport you to the Tulloch Caledonian Stadium for the game. If you are there for 3.45pm Norman Coleman will have a "gift" for you as a thank you for travelling to the game so please do not miss out. It will be worth it and it is a gesture for your making it to the game to get behind the lads on the pitch. I'll make no prediction on this game as I have never seen Crusaders play before. However, given their win over Dundee United and their current form in the Irish Premiership then I would expect them to be an accomplished side well capable of troubling an Inverness side in indifferent form and during our rebuilding process. It will be a first for Inverness to be playing an Irish side and a welcome break from the somewhat turgid games we have witnessed in the Championship. Crusaders come over with an exciting free scoring side and we should be in for an entertaining match. Anyway, welcome to the Highlands of Scotland and I hope you enjoy our national drink, it's made from girders you know, although made with less sugar now. Sláinte............ It's not great quality, but here's how Dumbarton got into the final. Two cracking strikes to win it. Matchday Thread Hearts -V- I.C.T. most memorable moment in ICT history? Thought this may be of interest to some, shame I never heard earlier, anyway... Young Scot are doing a giveaway of 25 pairs of tickets for young people, you have to be aged between 11 and 26 and have a Young Scot Card. Go to https://rewards.youngscot.org/ and sign up with your young Scot Card for rewards (if you haven't already done so). You then have to earn 500 points on your rewards. This is quite easy though as all you need to do is then do a few things like follow them on twitter, FB and do a survey etc to reach that target, the site has a full list! There are other rewards too. They are first come first served though so don't mess about, get a ticket for you and your mate!